Last week, a friend asked if I’d ever had Japanese cheesecake. What? They do cheesecake differently in Japan? Uncle Tetsu who? Apparently, I live under a rock, because I’ve never heard of the guy, but I did my research and found many recipes, one of which said hers always got rave reviews, but added that “it is quite difficult to make.” Oh, yeah? Well, we’ll show her! This cotton-soft lovechild of a cheesecake and a soufflé is often dusted with matcha, cocoa and/or confectioner’s sugar in the shape of Hello Kitty, lacy flowers or whatnot. Mine is most fitting as it bears a vintage version of the Japanese flag created using a stencil cut from a paper printout. 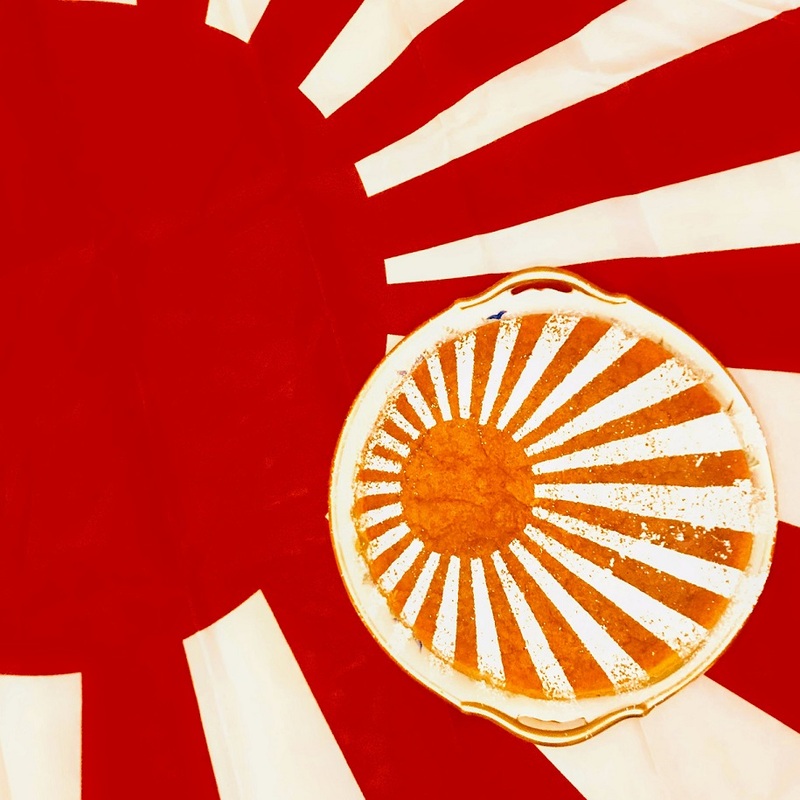 The modern flag continues to represent the nation’s nickname The Land of the Rising Sun depicted without the rays. Now, ordinarily, the word soufflé sends me running off, screaming like a banshee. It sounds like something fussy, complicated, best left to the professionals, but, really, you don’t need a Japanese passport to make this gorgeous, delicate cheesecake. Here are a few secrets to success. Separate the eggs and return the whites to the fridge until you’re ready to whip them. Cold egg whites make a fine meringue. If the mixing bowl and/or whisk are not very, VERY clean and/or there is any yolk in the whites, the whites will not whip up. To be sure yolks don’t sneak into the whites, break each egg into a separate bowl, then transfer the whites to the mixing bowl. Brush the butter in vertical strokes up toward the rim of the cake pan, the direction you want your cake to rise, UP! Then line the bottom and the walls inside the cake pan with parchment paper and butter the paper liberally. Don’t skimp on these steps as the batter will stick and any efforts to remove it will damage the delicate cake. Just skip it. Most recipes call for flour, cornstarch or some combination of the two which make for a dense texture. We’re going to toss them both out, because we want a cake as soft as puffy clouds (plus, my beloved nephew can’t have gluten). To prevent cracking, always use superfine sugar for your meringue, unless you don’t have superfine sugar. Then just use the regular stuff. Cracks add rustic charm and taste just as yummy. If you do nothing else, this is the one thing you should take seriously. You’re going to want to grab that bad boy out of the oven and sink your teeth right into it. I totally get it, but you must be patient. Turn the oven off and let the cake rest in there, still in the water bath for an extra 20-30 mins, then remove the water bath, crack the door open just a smidge with a wooden spoon or oven mitt, and let your cake cool gradually another hour. Butter a 9 -inch round cake pan, then line the bottom and sides with parchment paper. Butter the paper on the side sides of the cake pan in a vertical direction toward the rim. Up to the sky! That is the direction you want your cheesecake to rise. Up to the sky! Separate eggs and chill egg whites. Mix cream cheese, butter and milk til smooth. Add 1/2 cup sugar, egg yolks, lemon juice and vanilla extract. In another bowl, whip egg whites and cream of tartar. Slowly incorporate the balance 1/2 cup sugar and mix until soft peaks form. Gently fold 1/3 of the egg white mixture into the cream cheese mixture. Now, pour the yolk mixture into the bowl with the last of the egg whites. Fold gently, scraping the batter from the walls of the bowl. Pour mixture in the prepared cake pan and place it into a larger baking dish. Fill enough water to come halfway up the walls of the round cake pan. Reduce heat to 250*F and bake another 10-15 mins. Turn the oven off and leave the cheesecake inside to cool to room temp. Crack the door open with a wooden spoon. Here are a few terms I’ve picked up over the years. Please forgive any misspellings as they should be written in kanji characters and not English, anyway. I worked many years for a Japanese company and am fond of the culture of such an old nation. Shinto is the oldest religion in Japan, dating to the 8th Century, still practiced today alongside Buddhism. Its name translates to “The way of the gods” referring to the worship of ancestors, Nature and a sacred power called kami which resides in both animate and inanimate objects. There are many Shinto festivals, but Shichigosan remains my favorite. Its name means 7 (shichi), 5 (go) and 3 (san) as it is a celebration of children ages 3, 5 and 7. Parents thank the gods for their children’s health and pray for their safe, successful future. You don’t have to be Japanese or Shinto to recognize what blessings children are. With the holidays in full swing, little ones are at the center of celebrations. Indulge every sweet tooth at your next gathering with this light and airy Japanese cheesecake. It’s effortlessly gluten-free, too! I ditched the flour and pretty much threw everything together and got a cotton-soft deliciousness. Just don’t skip the buttered parchment paper and remember to let the cake cool verrrrrrry sloooooowly. Be patient and you shall be rewarded. I must live under the same rock, because until reading this I’d never heard of Japanese cheesecake (or Uncle Tetsu)! I’m all over this recipe — perfect for my gluten-free cheesecake-loving 14 yr old. 🙂 And I love how you made the flag. I also have an affinity for the Japanese culture — my dad was in the air force in Japan (as a dentist) and when my brother and I were growing up he’d often speak Japanese, share Japanese art with us, and we all loved sushi long before it became a trend in the US. How neat! I didn’t know that about you. Hope you try this one, Valentina, and let me know what you think. I am joining you and Valentina under that rock! So glad to learn about this – it sounds so delicate, and the flag pattern is stunning! Brava, my dear friend! Thanks, my sweet friend! It was an easy trick. Let me know if you bake one and how you like it. I’ve had an Uncle Tetsu cheesecake. They’re delicious. And I’ve wanted to make one, so thanks for the recipe. Happy to hear it. Let me know how you like it!